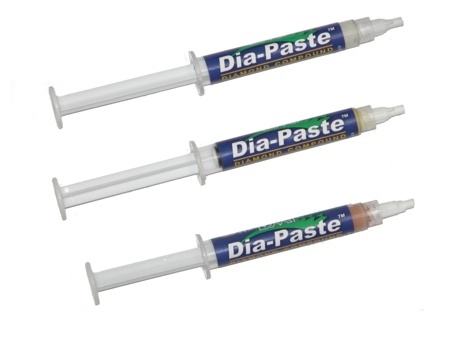 Improve tool performance with DMT’s easy-to-use Dia-Paste™ Diamond Compound. A light application will create a highly polished, mirror finish, reducing tool friction for a sharper, stronger edge allowing more use between sharpening. Apply oil-based compound to flat surface; using precise angle control, sharpen tool against the compound to achieve desired results. Packaged in a convenient 2-gram syringe. Choose from 1,3 or 6 micron compounds. Copper coded (6 micron / 4000 mesh) removes scratches with light pressure polishing action. Yellow coded (3 micron / 8000 mesh) for a glossy bevel edge. Gray coded (1 micron / 15000 mesh) for the ultimate polished mirror bevel edge. For proper tool maintenance, woodworkers, chefs and other professionals rely on the superior quality and versatility of DMT® products. Made in USA.